Welcome to QF(x), Quantifind’s official technology blog. This is the first of a series of blog posts where we will cover different aspects of our platform, including the products and solutions we are working on to help marketers make better business decisions informed by the voice of intelligent data and their own intuition. Today seemed an appropriate day to start this blog, as we’ve just announced the general availability of our flagship SIGNUM Analysis product, which helps marketers explore, understand and change their impact on revenue in real time. What’s most exciting to me is that our platform solves a problem that the industry has been trying to solve for a long time—connecting marketing with revenue results. Before I joined Quantifind, I spent several years building social listening solutions used by hundreds of global brands and agencies. After a decade of R&D, we had built one of the most accurate and sophisticated Natural Language Processing (NLP) platforms in the industry, analyzing billions of social conversations across dozens of languages from around the world. One of the biggest challenges we faced, especially at the executive level, was how to tie social metrics (e.g. 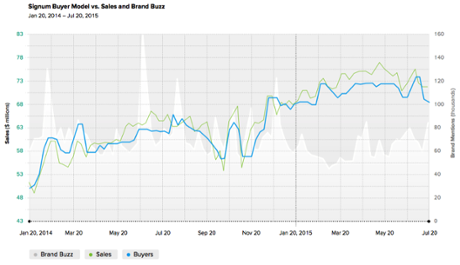 buzz, impressions, and sentiment) to business results. This turned out to be very hard to do. Too often we saw social metrics spike while sales stayed flat, or sales would drop with no commensurate change in social signal. Quantifind’s unique approach—finding the signals that correlate to business KPIs—fills this gap I personally experienced working with marketing teams and agencies over many years. Marketers have no lack of consumer data at their disposal, from social networks and consumer surveys to call logs and online forums. In fact, many would say they’re suffering from data fatigue. However, they haven't been able to crack the code on using it to drive and change business outcomes. Quantifind's explanatory analytics approach filters out the consumer data that isn't correlated to revenue and gives marketers an intuitive way to explore the data that does correlate to revenue. For the first time, marketers have real-time access to insights into what is and isn't driving their business forward and the ability to explore ways to change it. The first thing we do is to identify real and authentic consumer conversations (which we call Organic conversations) by filtering out marketing messages, spam, bots and other irrelevant posts from what we call Brand buzz. Once this is done we analyze millions of these conversations over several years to find language patterns that correlate to movements in sales (or other KPIs relevant to the business). We use these language patterns to create an explorable universe of insights. It is, in effect, a big, dynamic and organic focus group of people whose views and opinions impact revenue, searchable and discoverable without the artificiality of survey questions. We typically find that around 20% of all consumer conversation actually matters to sales, which we call Buyer conversations. Below is a real-life visualization of a company’s Brand Buzz, Sales, and Buyer conversations. While the Brand Buzz volume is an order of magnitude larger than the volume of the Buyer signal, the Buyer signal actually tracks to Sales. And as you can see, the Brand Buzz (including sentiment) has no correlation to sales and clearly shouldn’t be used to guide business decisions. The Quantifind-created Buyers line, on the other hand, is a great proxy for what matters to the business. What’s driving revenue for me, my competitors, and my category? What regions, demographics and topics are driving growth, and how do I tap into those trends to create a competitive advantage? Where do I already have a competitive advantage in my marketing to leverage, and where are my competitors’ marketing strategies and messages weak? Where am I losing market share, with which demographics, to which competitors and why? What marketing messages resonate most with which consumer segments, and which ones drive differentiated growth for me vs. growth for my category overall? We will cover specific, real-life, examples of how we help answer these types of questions in subsequent blogs to come. I hope this sheds some light on our approach and sparks your curiosity to learn more.